In the Church's Liturgy of the Hours, Evening Prayer, also know as Vespers, always includes the great prayer of Our Blessed Lady known as the Magnificat. Each day, the Magnificat is preceded by a short verse or "antiphon" that links the prayer to the feast of the day or the season of the year. In the last seven days of Advent (December 17-24), the antiphons before the Magnificat are very special. Each begins with the exclamation "O" and ends with a plea for the Messiah to come. As Christmas approaches the cry becomes increasingly urgent. These moving "O Antiphons" were apparently composed in the seventh or eighth century when monks put together texts from the Old Testament, particularly from the prophet Isaiah, which looked forward to the coming of our salvation. They form a rich, interlocking mosaic of scriptural images. The great "O Antiphons" became very popular in the Middle Ages when it became traditional to ring the great bells of the church each evening as they were being sung. 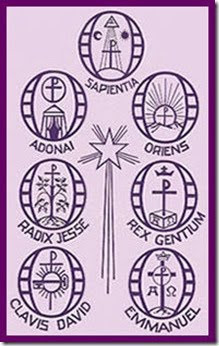 Each of the O Antiphons highlights a different title for the Messiah: O Sapientia (O Wisdom), O Adonai (O Lord), O Radix Jesse (O Root of Jesse), O Clavis David (O Key of David), O Oriens (O Rising Sun), O Rex Gentium (O King of the Nations), and O Emmanuel. Also, each one refers to the prophecy of Isaiah of the coming of the Messiah. A particularly fascinating feature of the O Antiphons is that the first letter of each invocation, when read backwards, forms an acrostic in Latin: the first letters of Sapientia, Adonai, Radix, Clavis, Oriens, Rex, and Emmanuel in reverse form the Latin words: ERO CRAS. These can be understood as the words of Christ, responding to his people's plea, saying "Tomorrow I will be there." 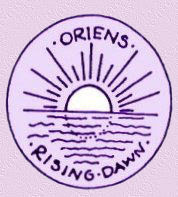 O Oriens (Is. 9:1): O Rising Sun, you are the splendor of eternal light and the sun of justice. O come and enlighten those who sit in darkness and in the shadow of death. Just as the natural sun gives light and life to all upon whom its rays fall, so Christ, the Rising Dawn, dispels darkness and brings eternal life and light. Saying the O Antiphons as a family, whether during grace at meals, in front of the Crib, or even in front of the Christmas tree, is a wonderful Advent devotion and a fitting way to prepare for the great events of Christmas.